Hot Air Airships, also known as Thermal Airships, offer a phantastic compromise between the ease of use common to hot air balloons and the maneuvrability of real airships. Basically, they are elongated hot air balloons with a propulsion engine and added tail fins and rudders. Their main uses are in sportive competition, advertising, and environmental work. Operation of Hot Air Airships - how and why thermal airships are flown. Hot Airship Competition - how thermal airships are "raced." Championship Results - includes upcoming event dates. 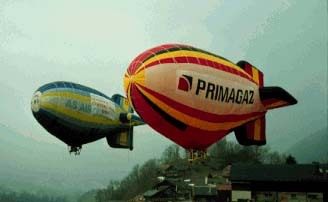 Hotships in Crans-Montana 1999 - report on a thermal airship meet. Two Cameron DP-Series airships (left a DP-70, right a DP-80). Most hot air airships flying in competition today are pressurized models. The internal pressure makes the envelope more rigid and prevents "denting" of the nose at higher speeds.